I love Made By Rae's buttercup purse. I needed some a new summer purse. 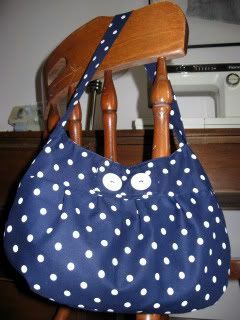 I had some polka dot fabric sitting in my fabric stash for waaaay too long. And some vintage buttons from my Grandmother's button box that needed to see the light of day once more. Put it all together and you've got this! Please ignore my 1972 Kenmore sewing machine. It was a hand me down from my mom - but it still runs great! Can you use batting instead of the insulating fabric? I can't find the insulating stuff at the fabric store. This is so geeky - I like! Especially the communicator purse, it's amazing. The side pockets are brilliant. Although knowing me, my stuff would jump out of them so they can ride in the very bottom of the bag. I just have that kind of luck. The peg boards are genuis! The only thing I changed was the handles. I left the cabinet part as is. I use 3 strips per braid. I hold the knot between my knees to keep the braid taught and braid until I get to the end of the pieces and then tie a slipknot finish it off. What a professional job. I am in awe of your mad upholstering skills. 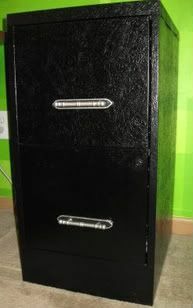 I got this el-cheapo filing cabinet as a gift. Wouldn't you know it, the plastic drawer pull snapped off in my hand shortly after. (Darn you Wally World!) Rather than toss out the whole thing, I found some kitchen cabinet handles at the Habitat Restore. The good news: the handles had a backplate that would cover up the current holes in the metal filing cabinet. The bad news: The handles were fugly 1970's brass. Some black and silver spray paint in my garage fixed the 1970's-ness. A drill and a screwdriver from the cabinet usable again.